If you are looking for information on the Sertinos Coffee franchise business opportunity, Sertinos Cafe franchises or Sertinos franchising, then you have come to the right place. Today's specialty coffee house is a social encounter that defies all other dining experiences. It is a welcoming environment that fosters warmth, human interaction and shared experience. We have strategically designed our interiors to be as comfortable and inviting as possible to enhance our intimate Sertinos experience - a look and feel designed to make your customers feel comfortable, while facilitating service and maximizing sales. There is no time like the present to tap into this business. As a potential Sertinos franchise owner we know you are seeking out new business opportunities to capitalize on the explosive growth of the specialty coffee market. A Sertinos franchise comes with great potential. You will be indulging your customers with more than fine coffees and tea. You're brewing a community as inviting as the neighborhood itself. We are a part of an established hospitality business of quick service restaurants - All American Specialty Restaurants of Portland, Oregon. We value integrity, professionalism, enthusiasm and spirit. Your motivation and willingness to dedicate yourself and ability to deal effectively with people are ideal for our team environment. We are all about hospitality, quality and variety. We maintain the highest standards of quality of our coffee products. Our trained roasters uphold the quality of our products by focusing on the flavor of each bean by hand-roasting small batches of select coffee beans. For those non-coffee drinkers, our extensive menu caters to all customers' tastes from tea drinks to hot chocolates to iced beverages like frappes and Italian sodas. The Sertinos Coffee concept has been expanded to include another brand choice, Sertinos Café. A Sertinos Café prominently features coffee products, light meal items (sandwiches and salads) and in some cases ice cream and frozen yogurt products. It is positioned different from the existing All American brands within the emerging quick-casual restaurant segment. Whether or not you are experienced in the restaurant or retail fields, we take the time and care to get you acquainted with the tools and knowledge needed to thrive. In our initial and ongoing training programs you will learn what it takes to be in the hospitality business and what Sertinos is all about. Are you ready to get in on the Sertinos excitement? Why wait another minute? 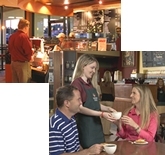 Sertinos is ready to help you bring a new kind of coffee cafe experience to your community. As a leader in quick service restaurant business, All American has done all the groundwork and perfected the recipe for your success. Click here for information on Sertinos Cafe.